Movistar Yamaha MotoGP’s Jorge Lorenzo gave a sensational performance this afternoon, claiming his fourth GP victory in a row at the seventh round at GP Monster Energy de Catalunya. 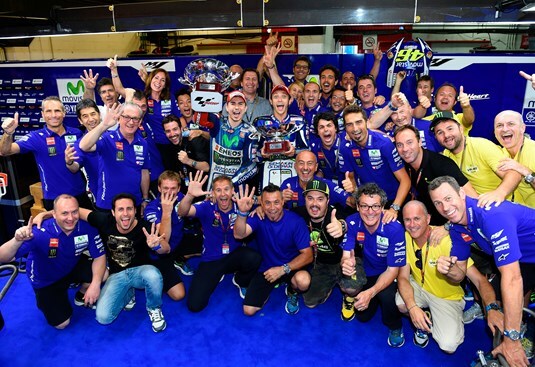 Teammate Valentino Rossi was equally stunning, starting from seventh on the grid to take second position, giving the team its fourth consecutive double podium of the season. Jorge Lorenzo took a sensational fourth consecutive win for the first time in his career in front of a massive home crowd at Montmeló this afternoon. Similar to the previous round, he led the race from start to finish, which means he set a new record for consecutive laps led in the MotoGP class with an incredible total of 103 laps. Teammate Valentino Rossi also put in a brave performance at the slippery and greasy Circuit de Barcelona-Catalunya to finish second, making it a perfect weekend for the Movistar Yamaha MotoGP team. Lorenzo had a strong launch from third on the grid to take the holeshot. Leading the race from Marquez he put the hammer down in an effort to break away from the field, but was unable to shake off his compatriot. Unfazed by the pressure from his rival, Lorenzo kept his riding smooth and consistent, which proved to be the key to success. With 23 laps to go, Marquez made a mistake in turn ten, nearly clipping Lorenzo’s YZR-M1 in the process, and crashed out of the race. The dramatic crash put Lorenzo in his favorite racing position; completely in control at the front, with a clear track as far as the eye could see, and a growing gap to the rider in second, which was none other than his teammate. Rossi wasn’t able to threaten until the last six laps, but Lorenzo managed the gap perfectly and held on to claim the victory in front of his home fans, with a 0,855s margin over the line. Accompanied on the podium by Yamaha Motor Co., Ltd’s President, Hiroyuki Yanagi, Lorenzo got to step onto the top step for the fourth time in a row for the first time in his career. The Doctor started his Catalunya attack well, but found himself in seventh place going into turn one. Determined to score a top result he overtook Aleix Espargarò and Bradley Smith before the end of the first lap. Pol Espargarò in fourth was soon to follow, as Rossi continued to hunt down Andrea Dovizioso, passing him on lap four. As Marquez crashed out a lap earlier, The Doctor was riding in second place and gave all he had to reel in Lorenzo, who was 1,5s ahead, but the Spaniard was quick to respond. Rossi kept his head down and was able to reduce the gap to nearly a second in the final stages of the race, but came just short. He went on to claim second on the podium, with a 18.570 second gap to Dani Pedrosa in third. Lorenzo’s win delivers 25 points, keeping him in second position in the championship standings with a 137 points total, just one point behind Rossi. The Doctor’s podium scored him 20 points and keeps him in the lead in the overall standings, now on 138 points. The MotoGP riders will be back on the Catalunya track tomorrow for an official test before visiting Aragon for a private test. They will then head to the Netherlands for the next GP held at the iconic Assen TT circuit on Saturday the 27th of June. Monster Yamaha Tech3 Team rider Bradley Smith rode to another strong result aboard the Yamaha YZR-M1 at the Gran Premi Monster Energy de Catalunya to equal his best performance of the 2015 season and finish in 5th. The young British rider commenced the 25 lap battle from 8th on the grid and undertook an expert start as the lights went out before going on to finish the first lap in 6th. He quickly set into his race pace and posted strong lap times that elevated him up to 5th. As the race distance progressed, he eventually became involved in a tussle with Andrea Iannone who he kept at bay until the 18th lap. Smith was shuffled back to 6th but remained resolute and pushed onwards. With five laps remaining he was running comfortably in 5th and powered across the finish line in this position. His performance today sees him close to one point of Marc Marquez in 5th position in the MotoGP riders championship standings. On the other side of the Monster Yamaha Tech3 Team garage, Pol Espargaro was unfortunate at his Home Grand Prix as he fell in the opening stages of the race. The Spaniard began the race with a superb start from 11th place on the MotoGP grid and closed the first lap in 4th having overhauled 7 riders. He then set into a strong rhythm as he intended to continue his progress towards the front of the field. Yet, his luck ran out and he fell on the 4th lap whilst locked in a battle with his teammate and Dani Pedrosa which marked a disappointing and premature end to his promising start to the 7th round of the MotoGP World Championship. The Grand Prix of Catalunya weekend closes with a victory in the Open category for the Athinà Forward Racing team. Stefan Bradl crossed the line in eighth place as the first of the Open bikes, picking up eight important championship points. The German, who started from the fifth row, was finally able to reach the top 10, having been a protagonist in an exciting fight with Petrucci. After overtaking the Italian he continued to push until the end of the race and passed under the checkered flag in eighth place. It was also a good race for his teammate Loris Baz. The Frenchman, after an all-in race, finished in thirteenth position, once again hitting the top 15. With the points collected today Baz shortens the distance to Barbera who retains only a three-point margin as the leader of the Open class. The work of the Athinà Forward Racing team will continue tomorrow at the Catalunya circuit where a one-day test is scheduled.